Bus drivers on strike in Medellin are demanding greater protection and security from the local government. Photo by Jimmy Baikovicius. 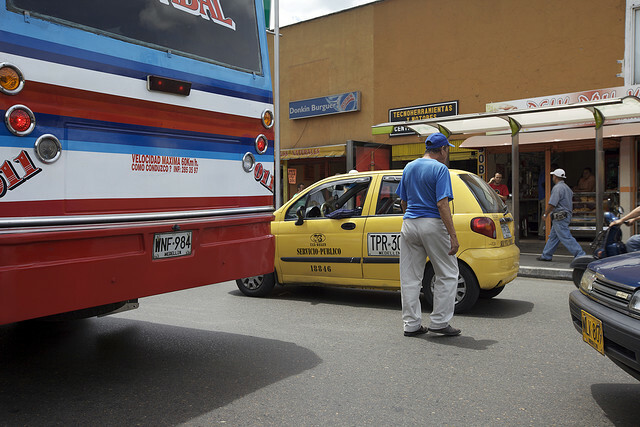 Neighborhoods in Medellin, Colombia were recently paralyzed by a bus driver protest. The strike was triggered by the murder of Duban de Jesus Botero Vera, who was gunned down after his refusal to pay a vacuna extortion fee. The slain bus driver had been driving a bus in Medellin for nearly two decades since the age of 14. More than 50,000 people have been affected by the strikes in more than nine neighborhoods in northeast Medellin, the second biggest city in Colombia and the capital of the state of Antioquia. The group claiming responsibility for the murder, Los Muchachos, demands 50,000 pesos (US$25) per week from bus drivers. Jesus Botero Vera is the fifth bus driver to be killed in Medellin this year. The bus drivers have been on strike since July 22 to demand better protection from extortionist gangs. This strike comes only one week after a similar protest to demand better security from police and administration officials. The strike stopped more than 170 buses from four routes and metro integration. Opportunist taxi drivers have taken advantage of the situation gouging residents with high prices to transport them to and from the neighborhood. Medellin bus drivers retaliated against the murder of one of their own by assassinating a teenaged gang member, attaching this note: por matar conductores (“for killing bus drivers.”) Despite the fact Medellin has a metro and is implementing brand new cars this summer, the system only serves a small portion of trips in the city. Consequently, a majority of citizens rely on a chaotic collective bus system. “The neighborhoods affected are primarily the ones higher up the hills, so the poorer barrios,” Alsema says. Government agencies in developing countries face tremendous difficulties and outside factors to implement efficient transportation for citizens. Public transportation is a necessity in poorer neighborhoods, and when left unregulated, leaves citizens vulnerable to more powerful and illegal forces.